Fringe Purse There are 13 products. Handmade boho hippie festival fringe cross body bag with black suede tassels and a removable strap handmade in Thailand. This fringe bag can also be used as a clutch purse. 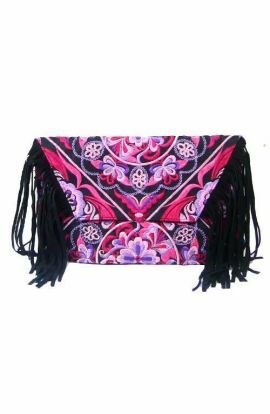 Length - 11"Height - 8.5"Removable Leather strap - 44-50"
Handmade cross body boho hippie festival fringe bag with fuchsia suede tassles and a removable strap handmade in Thailand. This crossbody bag can also be used as a clutch purse. 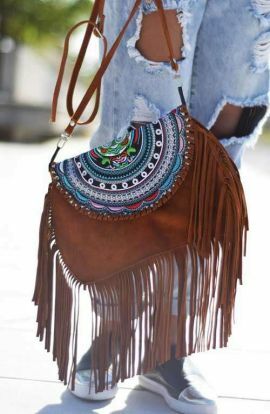 Length - 11"Height - 8.5"Removable Leather strap - 44-50"
A boho gypsy style rustic brown suede crossbody bag with fringe and removable strap to be used as a clutch. This fringe bag can also be used as a clutch purse. Approx Width - 11" Approx Height - 8"Height with Tassels - 14" Strap - Adjustable and Removable. A bohemian clutch bag with a gorgeous Hmong Hill Tribe textile and white leather fringe. This fringe bag is the perfect clutch purse for all festive occasions. Length - 11"Height - 6.5"Removable Leather strap - 42"
A colourful textile designed into a gorgeous clutch bag with leather fringe and removable leather strap. This fringe bag is the perfect clutch purse for all festive occasions. Length - 11"Height - 6.5"Removable Leather strap - 42"
A gorgeous crossbody bag with Hill Tribe design embroidered print and nappa leather tassels. This shoulder bag has a removable strap and can be used as a clutch bag. Length - 11"Height - 7"Leather strap - 42"
A black suede fringe bag handmade in Northern Thailand with suede and Hmong inspired textile. This crossbody bag can also be used as a clutch purse. Approx Width - 11" Approx Height - 8"Height with Tassels - 14" Strap - Adjustable and Removable. Distinctive tribal pattern bohemian crossbody bag with leather fringe tassels handmade in Thailand. This fringe bag can also be used as a clutch purse. Length - 11" Height - 8.5"Removable and Adjustable Leather strap - 44-50"
Beautiful yellow tribal crossbody bag with black leather tassels handmade in Thailand. This gorgeous boho bag comes with a removable leather strap so can also be used as a clutch purse. Length - 11"Height - 6.5"Removable Leather strap - 42"